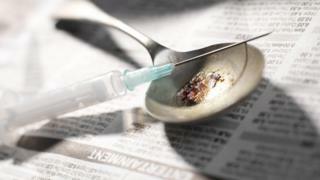 Police are warning drug users over possible contaminated heroin after seven people died in the Barnsley area over the last three weeks. Officers believe that batches of the drug may have been contaminated with a powerful anaesthetic. South Yorkshire Police said the latest death was reported on 3 May. Two other people died on 20 April. Three men and a woman were found dead at separate addresses in the Barnsley area on 14 April. The force said it was "keeping an open mind as to the circumstances surrounding each death and continue to explore whether there are any connections between them". Assistant chief constable Tim Forber said previous warnings issued across the Yorkshire and Humber region indicated that batches of heroin may have been contaminated with carfentanyl and fentanyl. Police said fentanyl is an anaesthetic used to help prevent pain after surgery or other medical procedures and is 100 times more potent than street heroin. Carfentanyl is stronger than fentanyl and is used on animals, said the police. Mr Forber said: "We continue to work with our partners in public health to raise awareness of the risks to drug users and I would urge anyone who has concerns, or has taken a substance and feels unwell, to please seek medical advice immediately."